It’s fair to say that many people use their gardens as somewhere to just sit and relax, or somewhere for the kids to play. However, many people are now becoming aware of just how useful and efficient a garden can be. Whether it’s growing your own fruit and vegetables, using your back yard to keep hens or creating a cut-and-come-again flower garden, it’s surprising just how easy it is to turn your little patch into a working, money-saving space. So if you’re keen to make the most of your garden and save some money, here are a few pointers to get you started. Nettles must be one of the most detested of all garden ‘plants’. Notorious for their ability to spread and considered not much more than a common and persistent weed, it’s unfortunate to say that they’ve really earned themselves a bad reputation. But did you know that the humble stinging nettle makes not only an ideal home for wildlife, but can also feed you and your garden? Believe it or not, nettle soup is actually a delicious and nourishing meal, and can be made using the nettles you find in your garden. Nettles are often compared to spinach in taste, and during the first months of growth (around March to June) are perfect for cooking. Providing you’re sure they’ve not been sprayed with any chemical weed killer or pesticide, all you need to do is simply don a pair of gloves and pick the tender tips of the nettles. To make nettle soup, brown some onions and garlic in a saucepan. Then sweat some leeks, add some chard or spinach and then add the nettles. The process of cooking will break down the nettle (and sting!). Sweat for 5-10 minutes and then add a pint of vegetable stock. Season with black pepper and salt (and a pinch of ground cayenne pepper if desired), and cook for a further 20 minutes. Blend into a slightly smooth consistency and serve hot. Nettles are also a great alternative to chemical feeds and fertilisers. Garden nettle ‘stew’ – nettles that have been left to soak in rainwater for up to six weeks – is a fantastic liquid concentrate that can be added to water at a ratio of 1:10. Not only is it free, but it’ll also help to boost your vegetable and flower crops, saving you money on food for your soil and food for your stomach! Other dark green foliage plants such as comfrey are also a viable alternative to chemical liquid feeds. Just remember that giving over a little corner of your patch to such plants will save you money and prove to be more useful than a persistent pest! These plants are so cheap to buy, yet have many uses aside from their aesthetic qualities. Chamomile is well known for its relaxing and calming properties, so aside from being a useful plant that will grow in that undernourished, dry area of the garden, it’ll also make a soothing tea – the perfect antidote to the stresses and anxieties of modern life. 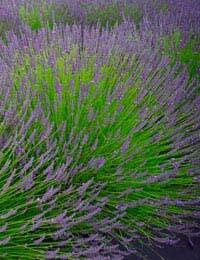 Lavender is also commonly used in herbal relaxing remedies – the essential oil or dried flowers can be used in bath soaks, bath salts, aromatherapy candles and pillows. However, the plant’s flowers can also be used in cooking, adding a unique twist to cakes, bakes, sweet and savoury dishes. Not too keen on synthetic air fresheners? Hang a bunch of dried lavender in a window, or use the dried flower heads in pillows and draw liners to fill your home with a wonderfully natural fragrance. Got a cyclonic vacuum cleaner? Simply add a handful of fresh or dried lavender flowers into the cylinder for a odour-busting burst of natural fragrance. These bold beauties are often used in companion planting – they’re great for luring blackfly away from your tender shoots and plants, eliminating the need to purchase costly pesticides. However, the flowers are also edible, and make a fantastically (free!) colourful addition to salads. Parsley might be thought of as just a culinary herb, used perhaps more as a garnish than anything else. However, did you know that parsley is also an effective breath freshener? Just a sprig or two can eliminate breath odour, with some studies suggesting that it also has antibacterial properties to boot. There are so many more plants that have multiple uses that will save you money – whether they’re herbs, edible flowers, healing plants or common weeds, the likelihood is that you’ll reap the rewards from your botanical buddies. All it takes is a little research, and you’ll be amazed at how much money you could save by planting a few choice plants in your back garden, window box or container! @Chris - thanks for your comment, this information will be useful to our readers. Don`t forget companion planting.I have a lavender bush(high in Nectar/pollen when in flower) planted next to my runner-beans to attract the bumble-bees.The bees then pollinate my runner-beans which increases crop-yields.